Should Podcasting Be Part of Your Bank Marketing Mix? Thanks to prodding from my sons, both long-time podcast listeners, I finally gave them a serious trial during the past month. Despite my skepticism, I’ve become a huge fan as well. And I figured out why I hadn’t embraced the medium; I was consuming on my laptop. Podcasts are clearly a mobile medium. To fully engage, I found that you need to be plugged into headphones and more importantly, away from the distractions of your desktop browser. Finally, I found the “speed-up” button and much prefer 1.5x speed which keeps my mind from wandering. Podcasts are having a bit of a moment. According to Pew Research, the number of Americans listening to a podcast in the past month has doubled in the past four years to 24% (and 40% have ever listened). This is small compared to the 90+% tuned into conventional radio, TV, or the Internet. However, the podcasting audience is the fastest growing media segment and there are solid opportunities for financial institutions, primarily in the B2B area with content geared to local small business owners. Although, you won’t find them on the iTunes top-100 (except Goldman’s effort, see Table 1, below), many major banks are actively podcasting. Most are aimed at investors or small businesses and are tucked away in the far reaches of their websites. Often, the only way to find them is through a Google search. Even the bank’s own search function, didn’t always locate them. However, Umpqua Bank is an exception with its consumer-focused podcast consistently featured on its homepage (see screenshot above). Bottom line: Unless you want to make a statement, ala Umpqua, or you have a budding podcaster in-house (quite possible), producing an ongoing interesting podcast is probably not cost effective for most smaller banks. But anyone big enough to be producing custom content for their customers/members/clients, should consider adding podcasts to their communications mix. Author: Jim Bruene (@netbanker) is Founder & Senior Advisor at Finovate as well as Principal of BUX Advisors, a financial services user-experience consultancy. Fidelity: Fidelity has three series: Rethinking Time, The Future According to Now, and Market Insights. All are geared to investors and look at industries, innovations, as well as general investing topics. Exchanges at Goldman Sachs: Covers industry and investing themes. The podcast currently ranks #54 in the Business category on iTunes. JP Morgan Asset Management: Insights Podcast: Market news and insights. PNC Bank, Business Webinars & Podcasts: Wide variety of business management topics geared at small business. Most are in webinar format. Umpqua Bank: Open Account Podcast: The podcast is located in the “Society & Culture” section and covers much ground. The host is former MTV personality, Suchin Pak and the tagline is “A show about making, losing and living with money.” Latest episode: “Getting Back in the Race” which is an interview of a former Olympic athlete Bryan Clay (see screenshot at top). I’ve long been impressed with the work done by Eric Bangerter (Director of Internet Services) and the UW Credit Union in the online channel. Nearly every one of its new features gets starred in my blog reader. 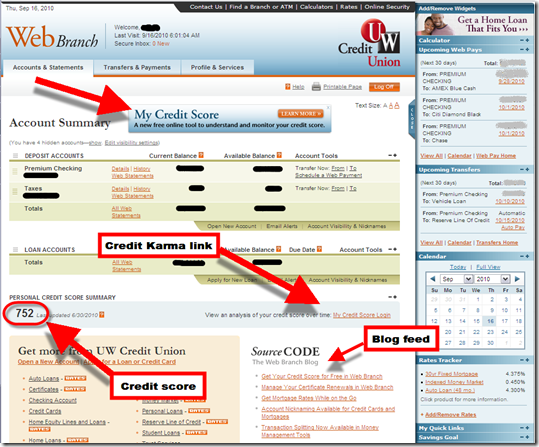 And since its early-2008 launch, I’ve cited Eric’s blog, UW SourceCode, as the best example of how to communicate to your power users and online banking fans (see blog feed within the online banking dashboard in the first screenshot). But the latest innovation might be my favorite. The Madison, WI-based CU has integrated credit scores, powered by TransUnion, directly into the online banking interface (see first screenshot). This is exactly where it should be, so that users can keep tabs of their credit health, without needing to go through the tedious and oftentimes expensive process of authenticating yourself at a third-party site. Even if that’s all they did, I’d give them an A+. But there’s more. UW CU has become the first financial institution to offer a private-branded version of Credit Karma’s credit report portal. 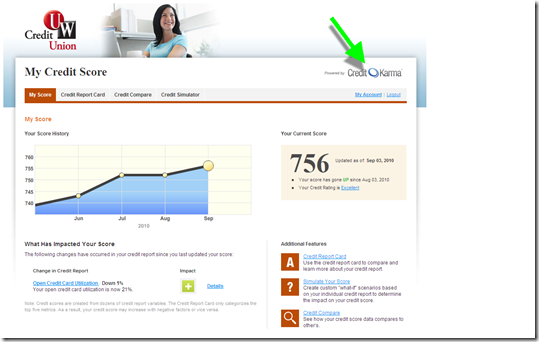 The credit union pays a license fee to Credit Karma in order to offer the private-branded, ad-free version (see second screenshot). Sears also offers a similar service for its store card (see previous post). UW CU members (120,000 active online bankers, see note 2) appear receptive to the info. In the first few days, more than 5,000 had clicked on the link, with more than 2,800 completing the registration process. That is a huge win for the members, the credit union, and Credit Karma. Bottomline: Most of the time (98%/99%), end-users need see their credit score only for reassurance that nothing horrible has happened to their credit file. But the problem with posting ONLY the credit score is that those 1% to 2% who want more info often need it fast. And if you don’t offer a deeper dive complete with explanations of what’s going on, you are going to end up with confused and/or irate customers and a bunch of phone calls. So, there needs to be a mechanism available for drilling down into the full report. And the Credit Karma portal is a relatively low-cost way to do that. Alternatively, you can upsell the full credit report for a fee in the $5 to $10 range or sell an annual subscription for unlimited access (see note 1). 1. For more information, see our Online Banking Report: Credit Monitoring Services (published in 2007). 2. UW CU has 150,000 members in total; 120,000, or 80%, have used online banking in the past 90 days; 80,000 (53%) used it in the past 30 days. To-Do List: Added to the dashboard to help you keep track of upcoming bills, goal progress, new savings ideas and so on. 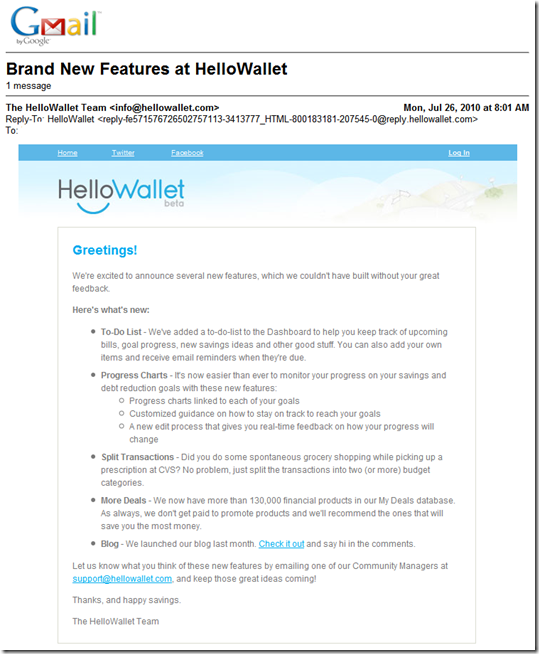 Users can manually add any item and receive email reminders. Progress Charts: Helps monitor progress on savings and debt-reduction goals. Split Transactions: Ability to split transactions into two or more budget categories. More Deals: My Deals database expanded to more than 130,000 financial products. These are solid enhancements and signal that HelloWallet will be a viable competitor in the OFM/PFM space (see previous post; note 1). I especially like the To-Do list, a relatively simple enhancement that helps increase the utility of the application. The company has attracted a steady flow of visitors, averaging about 25,000 unique visitors per month in May and June (see Compete chart below). 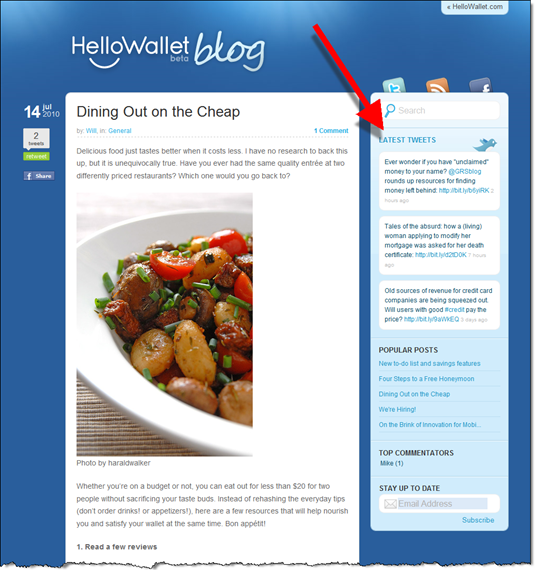 But the main reason for today’s post is to highlight the design of HelloWallet’s new blog at <hellowallet.com/blog>. The layout is visually appealing, incorporates social media sharing tools (Facebook, Twitter, RSS), and does a great job showcasing the company’s Twitter updates in the right-hand column (see first screenshot). This gives the whole blog a vibrant, up-to-the-minute feel, without burdening readers (and staff writers) with too many blog entries. So far in July, HelloWallet posted four blog entries and tweeted 53 times (2x per day), a good pace. Both the blog posts and Tweets contain a good mix of personal finance material, general info, and company news. 1. For more on the OFM/PFM market, see our recent Online Banking Report. One of the things I enjoy about using Gmail are the one-line ads displayed across the top of the screen. It’s fascinating to see how Google’s algorithm attempts to figure out what’s on the top of my mind by reading my recent emails (goodbye privacy). Last week, it correctly deduced that I’d be interested in a new initiative by Citibank; unfortunately, I didn’t capture the exact ad, but it pointed me to the URL <new.citi.com>, which itself was enough to get a click out of me. To my surprise, new.citi.com is an online microsite aimed at sharing the things Citi is doing to bring itself back from the brink. And it’s being told in blog format. It started in February with seven posts on Feb. 1. There was no activity for two weeks, but since then the bank has posted 15 new entries, about 2.5 per week, a good pace. The content is good. For example, yesterday they wrote about their no-overdraft philosophy on debit cards, a policy they’ve always adhered to. The bank even linked to Ron Lieber’s NY Times, Your Money column, “Overdraft Protection. Why Bother?“, just like a real blog. 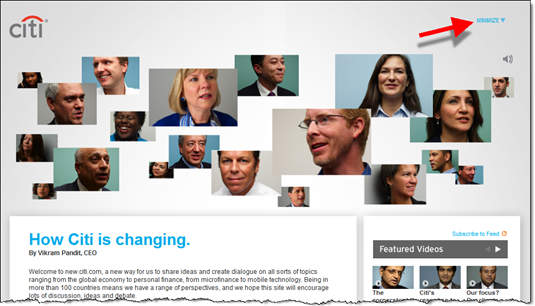 The design is attractive and consistent with Citi’s brand identity (see screenshot below). But it’s a little over-indulgent for a blog. Above the fold, all you see are Citi executive testimonials and an undated post from CEO Vikram Pandit permanently anchored there. I recommend activating the upper-right mute button to obviate the annoying little jingle that plays each time you click a new page. The bank allows comments, moderated of course. Most posts have just one or two, but the anchor post has 60. 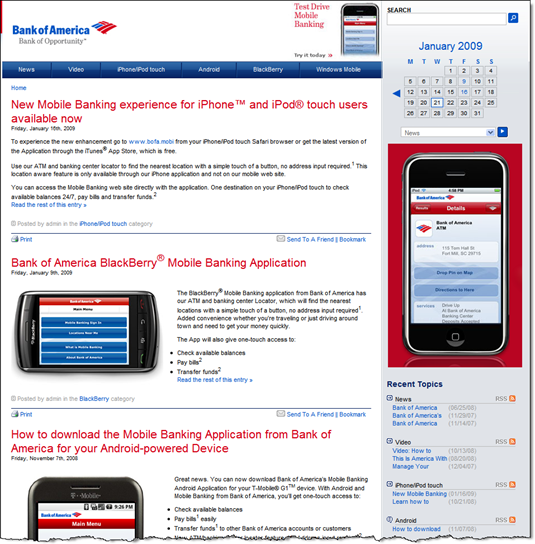 It’s good to see another major bank blogging, especially after Bank of America killed its innovations blog (note 1). And it’s a solid effort, good for the bank and its brand. A little restraint in the design department and this would earn an A grade. Note: You can get rid of the faces by clicking on minimize, and mute the jingle with the speaker sign, but few users are going to see those, or know what they mean. Note: For an even better example, check out Truliant Federal Credit Union’s superb new blog. The CU has an internal team that’s been doing five relevant posts per week since Jan 27. More than 10 months after the iPhone App Store launched, two U.S. credit unions have joined the application marketplace, which numbers more than 40,000 in the U.S. store alone. The first was Texas Dow Employees Credit Union (TDECU), whose ATM and shared-branch locator, Culoc8, launched on April 29, according to the company’s Twitter page (below, link). 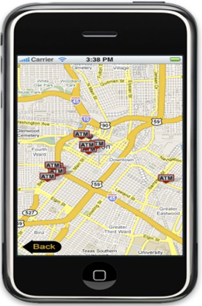 The TDECU app (see inset) is unbranded and can be offered by other CUs to their members. Eaton Family Credit Union is offering CuLoc8 to members on its website (see below). 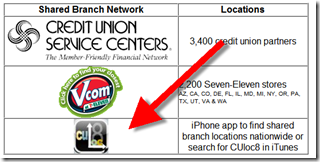 Yesterday, Tech CU, became the first credit union with a full-featured branded native iPhone app (App Store link, see note 1). 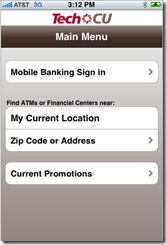 The app (see below) includes full online banking functionality and an ATM/shared branch finder (second screenshot). 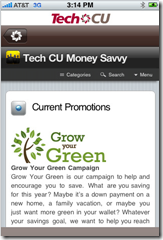 The credit union also added something we haven’t seen yet, an iPhone optimized feed of its blog, Money Savvy (third screenshot). Nice touch. Tech CU has offered a mobile website since Sept. 2007. 1. 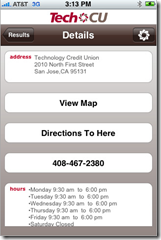 America First Credit Union was the first CU with native iPhone support via its participation in Firethorn’s shared mobile banking app which launched in Nov. 2008. When researching yesterday’s post on BofA’s iPhone app, I searched Google for “Bank of America mobile banking” and ended up at the bank’s mobile banking news blog (see screenshot below). This is the second blog the bank has launched in recent months. The first supports its MIT Center for Future Banking (post here). While purists may claim this latest effort is not really a blog because there are no community features such as comments, it’s updated infrequently (5 posts in 3 months, see note 1) and appears purely promotional in nature. The bank doesn’t even refer to it as a blog. 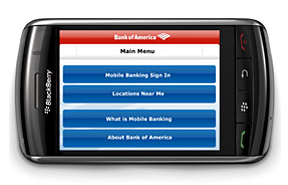 The official title is: Mobile Banking Media Center for Bank of America. But it’s laid out like a blog. The content is arranged in reverse chronological postings, with categories/tagging/permalinks. The variety of content includes YouTube videos, and you can subscribe via RSS feeds. That’s a blog to me, and a very good one at that. While the core audience consists of press and analysts, it’s a great resource for anyone interested in the bank’s mobile offerings. And as my search yesterday proved, Google has rewarded it with a high organic result, the first position on my search. That can potentially save the bank hundreds of thousands of dollars in search-engine advertising. Bottom line: Call it what you will, but BofA demonstrates one of the most effective uses of the blog-like format: supporting PR and educational efforts for a new strategic effort (mobile banking) in an easy-to-follow and easy-to-administer format (see note 2). 1. There are five posts on the homepage, but if you drill into the top categories, you’ll find some older press releases. 2. For more ideas, see our Online Banking Report on Bank 2.0 Techniques. 3. BofA’s new Blackberry app is shown at the top of this post. What better way to start the new year than to blog about a blog. And it’s big news. 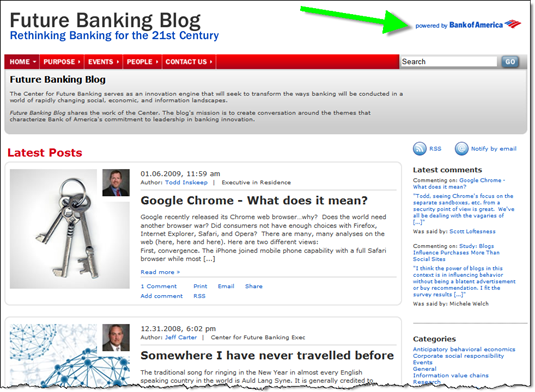 Bank of America, through its Center for Future Banking (see note 1), launched a blog called The Future Banking Blog. The blog, quietly began after Thanksgiving (note 2), has averaged about 2 posts per week, about right for a banking blog (note 3). The content so far has been wholly unrelated to Bank of America or its products. The blog is part academic, part strategic, bringing insights from the Center’s joint team of MIT academics and BofA business execs. The design however, is pure Bank of America (see below). It uses the BofA color palette and includes a prominent powered by logo in the upper right. It’s also housed under a bank URL <futurebanking.bankofamerica.com>. All in all it’s a good effort, positioning BofA as a thought leader in the upside-down world of commercial banking circa 2009. 1. The Center is seeking an Executive Director. The position was posted on Dec. 16, but given the holiday, it’s not too late to toss your name in the hat. 2. Hat tip to Colin Henderson at The Bankwatch for writing about it. 3. For more info on financial institution bloggin, see our Online Banking Report on Banking and Social Media. 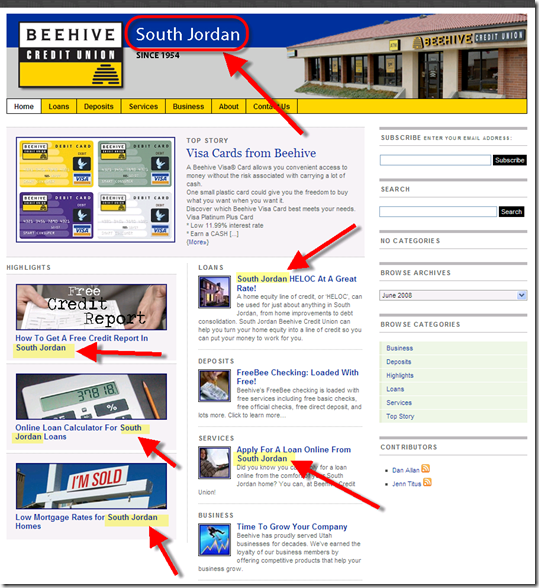 Salt Lake City's Beehive Credit Union is launching eight microsites, one for each of its eight branches. The sites are based on a blogging template and are nearly identical. 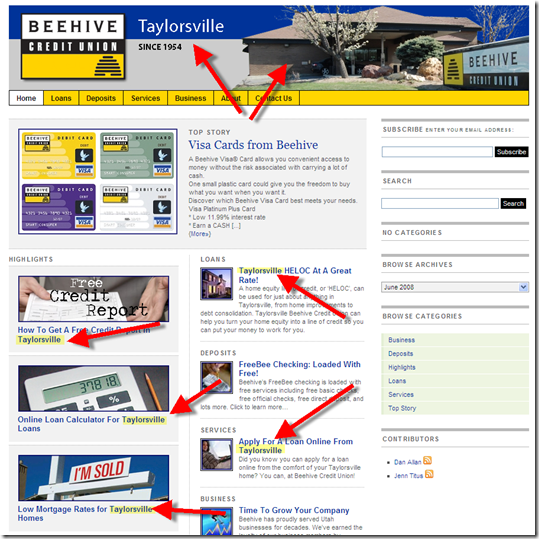 While I like what Beehive is doing, I hope they take it to the next level and create a more customized experience by letting branch employees add content themselves or at least control some aspects of the microsites. The CU is working with Listpipe for content creation. Thanks to Jeffry Pilcher for the find. 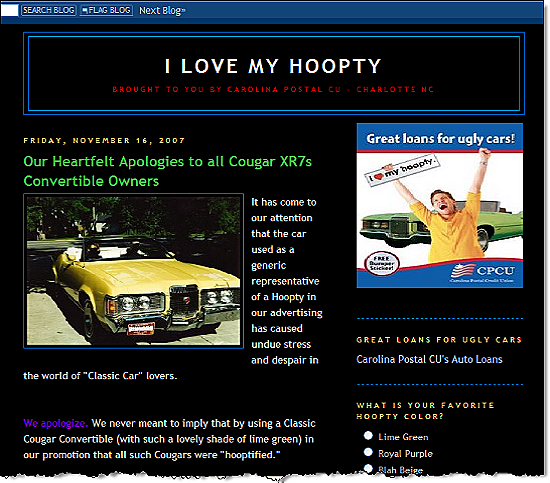 Blog Sighting: Carolina Postal Credit Union’s Irreverent "I Love My Hoopty"
Finally, we have someone using a blog to have a little fun (note 1). Carolina Postal Credit Union's blog, I Love My Hoopty, is using humor and user-generated content to drum up car loan business. Through its website and blog, the CU asks users to write about and post pictures of their first cars, and the more rickety the better. I wasn't familiar with the term, but apparently in this context "hoopty" means an old rickety car. 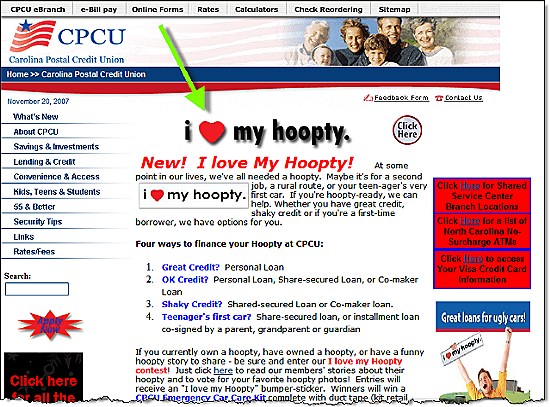 The hoopty theme is also used on the CU's homepage to promote vehicle loans (see second screenshot below). Since I'm twice the age of the target market here, it doesn't matter that the blog's content doesn't resonate with me. I LOVE the creativity and I'll bet the younger, Colbert-Report-watching crowd thinks it's pretty cool that a bank/credit union would do something this irreverent. Unfortunately, the follow-through doesn't look nearly as good as the creative. I first noticed this blog a few months ago, and until last week, it hadn't been updated since July. It doesn't really make sense to have a blog that's only updated a few times per year. If the CU doesn't have the resources to add something at least once per month, it should pull the blog down and incorporate the content into its main website. Also, I question the prominence of the campaign on the CPCU homepage. Is that really the main message you want displayed to your members for several months? Even if does fit the overall brand strategy, the CU should change the banner ad's hyperlink. Currently, it goes to the hoopty blog (after a short detour to acknowledge that they are leaving the CU's website), which is not an effective landing page. The CU should first take users to a dedicated lending page that explains loan options and prices and invites members to apply. 1. UMB used a similar approach in its My Ugly Room contest a year ago. I am in the process of creating a table for the next issue of Online Banking Report, our 13th annual planning guide. The table (see draft below) is designed to show the wide variety of blog types available to banks and credit unions (see note 1). It's a tabular update to the "45 Reasons for Banks to Blog" article in our Bank 2.0 report. Many (most?) blogs could be classified in two or more categories. For example, Royal Bank of Canada combines student marketing, event awareness, and recruiting at its RBC p2p site where the bank is soliciting entries for six college-student bloggers to create video and text content for its student site (screenshot below; note 2). Recruiting Quicken Loans What's the Diff? Online banking tips & tools ??? More information and links to the above blogs can be found in the "blogs" topic here. 1. For a thought-provoking editorial on how blogging can be incorporated into financial institution websites, check out Ron Shevlin's latest here. 2. Hat tip to Colin Henderson for posting about RBC p2p here. 3. ??? means I don't know of banking or credit union examples for these blog types; $5 Starbucks cards for the first commenter to fill in the blanks.